Why the name of Latin America? 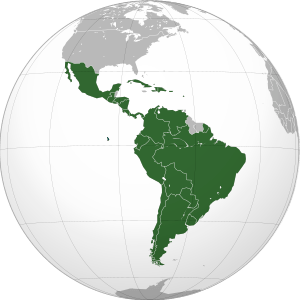 What does “Latin America” mean? The essentialist component of the ancestral search for identity as part of nationalistic projects – which kept intellectuals busy for such a long time, being Octavio Paz one of them- has not completely disappeared or has become a commercial relation of struggling signs in a new global context. And as usual, reality is a byproduct of mistakes of their own representations. What does “Latin” mean? For many years, the typical Latin American – which is another way to say “the stereotypical Latin American” – has been represented by the indigenous person of Aztec, Maya, Inca, or Quechua origin, who preserves their ancestral traditions and mixes them with the Catholic rites. It was the Castilian language and the violence of colonization what these peoples had in common. However, to European and North American eyes, and even to their own eyes, they were monolithically defined as “Latin Americans”. Those who lived in the region of Río de la Plata were called by Anglo Saxons “Southern Europeans”. If we go back to the ethimology of the Latin word, we will find a great contradiction in this former identification: none of the indigenous cultures found by the Spaniards in the new continent was related with Latin. On the contrary, other regions further south lacked this ethnic and cultural component. The greatest part of their population and culture came from Italy, France, Spain, and Portugal. To this objection of the Mexican essayist, Koen de Munter gives an answer of the same kind, observing that the indigenistic discourse has become fashionable as long as it refers to the defense of certain politically harmless, folkloric groups, so as to forget the very many people who massively migrate to cities and blend in a sort of compulsory mixed race groups. This mixed race thing, in countries like Mexico, would only be the central metaphor of a national project that began in the 90s as such. This source believes that we were lucky to be colonized by the Spanish and not by the English, which gave place to this mixed race in the continent. But Koen de Munter understands this discourse as being part some Hispanophile demagogy, a “mixed race ideology” as a result of which the unacceptable conditions of the current Latin American reality are overlooked. According to the author himself, Hispanophile makes these intellectuals forget about the colonial racism of the Spain that fought the Moors and the Jews as they made their way into new continent. In short, rather than mixed races, we should talk about “multiple violation”. Maybe because the term that had been suggested was too long, Carlos Fuentes decided to use “Iberian America”, being this, in my view, more specific than the one “interestedly” suggested by the French, since it excludes not only the French migration waves to the southern hemisphere and to other regions of the continent in question; it also excludes other immigrants, more numerous and as Latin as the Iberian peoples: the Italians. It would be enough to remember that, by the end of the 19th century, eighty percent of the Buenos Aires population was Italian, as a result of which someone defined the Argentineans –again generalizing- as “Spanish speaking Italians”. On the other hand, the idea of including the indigenous component (“Indo”) together with the name “America” implies that they are two different things. Similarly lucky has been the prudorous and “politically correct” reference “Afro-American” to refer to a dark- skinned North American who is as African as Clint Eastwood or Kim Basinger. We could think that the indigenous peoples are the ones to vindicate the denomination of “Americans”, but the term has been colonized as the earth, physical space, and cultural space were. Even today, when we say “American” we refer to the people from a specific country: The United States of America. As to this term, it is as important to define what it means as it is to define what it does not mean. And this definition of the semantic frontiers is not only derived from its ethimology, but from a semantic dispute in which the exclusion of all the non- North American has won. A Cuban or a Brazilian could provide a long list of reasons why they too should be called “Americans”, but the definition of this term is not established based on the intellectual will of some, but on the power of cultural and intercultural tradition. Although the first creoles who lived south to the Rio Grand, from Mexico to the Rio de la Plata, called themselves “Americans”, the geopolitical power of the United States grabbed this term, forcing the rest to use an adjective in order to differentiate themselves. This simplification may also be the result of the predomination of the other´s perspective: the European. Not only Europe and the United States have been historically self-centered and self-loving, but also the colonized peoples have. Few in America, with no important ideological influence, have looked at and studied the indigenous cultures as they have done with the European. That is, our simplified and simplifying definitions of “Latin America” may be the result of the natural confusion that the other´s look projects: all Indians are the same: Mayas, Aztecs, Incas, and Guaranies. Only in today´s Mexican territory, there was – and is- a wide spectrum of cultures that only our ignorance can confuse and group in the term “indigenous”. These differences were usually discussed by going to war or by sacrificing the other. Latin American republics were successive literary inventions of the intellectual élite of the 19th century. Defining, prescribing, and naming are not minor details. But reality also exists, and it never completely adapted to their definitions, despite the fertile imagination of violence. The difference between the Conception and the reality of the people were sometimes as big as injustices, exclusions, and violent revolts and rebellions dating back from centuries, which never reached the category of revolutions. What is represented remains weaker than its Representation.